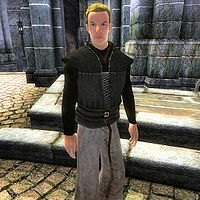 Agarmir is a Nord thief living in the Imperial City Talos Plaza District. He is a business partner of Thoronir, the proprietor of The Copious Coinpurse in the Market District. He claims to be a "simple trapper" who supplies many of the merchants of the city with merchandise. His wares ensure Thoronir has the best prices in town, but his methods may be found to be a bit shady. Before the related quest, he can often be found roaming around the Imperial City, always on the lookout for potential customers and... sellers. After waking up early at 6am he always starts off his day with a two-hour breakfast on the ground floor of his house. On weekdays (Morndas to Fredas) he wanders around his house until 4pm, at which point he exits his house and heads to the Market District, where he will stroll around till 8pm. On Fredas, he leaves the Market at 5pm and heads to The Foaming Flask, in the Elven Gardens District for a two-hour dinner before he returns to his usual routine. On the weekend, he leaves his house early at 8am and heads either to the Arboretum (on Loredas) or to Green Emperor Way (on Sundas). After returning home at 8pm, he spends the rest of the day pacing his house before his late bedtime at midnight. His hostile character is obvious upon meeting him, since he will greet you by simply saying: "Yeah?". If you ask him about the city, he will play innocent: "I supply many fine city merchants with goods. All sorts of things. Whatever I can buy cheap and sell dear." Once you have talked to Jensine and initiated the related quest he will pretend he never even heard of Thoronir: "Don't know anyone by that name. Now go away." When asked about his inventory, he will state: "Inventory? I am a simple trapper. My inventory just consists of pelts and skins. I would hardly call that inventory. Now get outta my way." When you reach stage 20 of the quest, Agarmir will leave his lodging at 11pm and travel to the small garden in Market District, just behind The Copious Coinpurse, to meet up with Thoronir. They will stay there all night until 7am, at which point Agarmir resumes his usual schedule. If you "overhear" the conversation, he will hastily return home. If you confront him with the contents of his basement before giving the Macabre Manifest to Thoronir, he will fake disgust: "I have no idea what you're talking about, but you have a sick mind. Get away from me." After you have exposed him to Thoronir, Agarmir will relocate to the Trentius' Family Mausoleum in Green Emperor Way and wander around with his companion Rolgarel. The moment you arrive, he will approach you and tell you about his set-up: "I had a feeling you'd catch on sooner or later. That's why I had this trap prepared for you. If you'll notice, the grave is already dug. This time, it wasn't to take something away from the graveyard, it was to add something. I'm afraid all I can offer you is an unmarked grave." At this point, he will suffer a disposition hit and will become hostile, attacking you immediately. Agarmir is armed with a unique leveled sword: Debaser. He wears a middle class outfit consisting of a pair of brown linens, a dark shirt and a pair of doeskin shoes. He also carries his house key and a small amount of gold. When he relocates to the Mausoleum, the related key is added to his inventory. It should be noted that Agarmir can be killed before the quest is complete. If he is, a message will be displayed to the player that the quest has been completed because a character essential to the quest has died. Everyone else related to the quest will act as if Thoronir is now in the merchant association. As with numerous other NPCs, Agarmir doesn't employ the principles needed to participate in the Speechcraft minigame. Agarmir was supposed to have breakfast at The Tiber Septim Hotel on Loredas and Sundas at midday, however, his packages to wander around the Arboretum and the Green Emperor Way are before on the list. Since both of them have a duration of twelve hours, they will always take priority and thus override his eating schedule. Esta página foi modificada pela última vez à(s) 19h46min de 25 de dezembro de 2015.